Short Video Competition for CIT Students - iPADS TO BE WON! 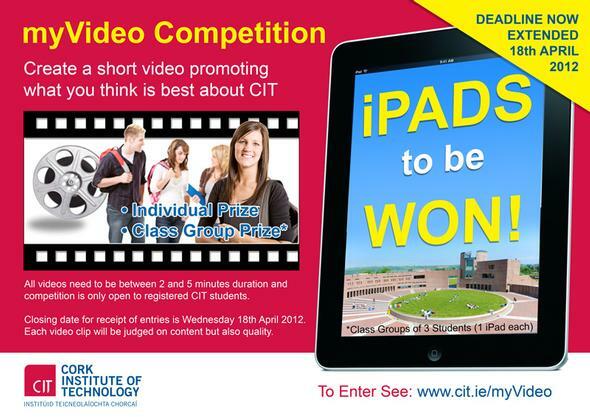 Cork Institute of Technology will be giving away several iPad 2 devices to students who produce the best short videos promoting what's best about CIT. A selection of these videos will be highlighted on our website, Facebook and Youtube sites. Please submit your video to the Info Desk, Bishopstown campus, on disk (USB / CD / DVD). Please ensure each disk is clearly marked with your contact details so that we can return if needed. Students in other campus locations, such as CSM / CCAD / NMCI, can email webadmin@cit.ie to arrange collection. Students can also use services such as our HEAnet Filesender Service (myCIT Account Required), Dropbox, YouSendIt etc and email links to webadmin@cit.ie with myVideo Competition in Subject line. Please click here if you need our various logos in EPS vector format.